January’s CMWA Meeting will consist of an open meeting to discuss woodworking interests and the upcoming activities for the CMWA. Please join on Wednesday, January 16th at 7pm at the Paramount, St. Cloud. The December 19th meeting is the CMWA Annual Potluck. The gathering will happen at 6pm, an hour earlier than our normal meetings, at the Paramount in St. Cloud. Members are encouraged to bring their significant other and a dish to share. November’s CMWA Meeting will consist of a viewing of “Refinishing Furniture Made Simple” by Jeff Jewitt. Join us on Wednesday, Nov 21st at 7pm at the Paramount, St. Cloud. 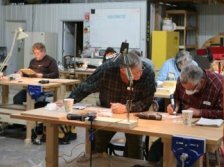 October’s CMWA Meeting will be a continuation of George VonDriska’s DVD titled “Essential Woodworking Techniques”. Join us on Wednesday, October 17th at 7pm at the Paramount, St. Cloud. Our September meeting topic will be a DVD titled “Unlocking the Secrets of Traditional Design”, with George Walker. 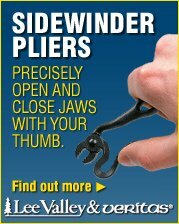 A Lie-Nielsen TOOLWORKS video. August's CMWA meeting will be a demonstration by Denny Myers on hand cut dovetails. July’s CMWA Meeting will be a DVD by Christopher Schwarz on the right tool to use for each stage of woodworking, roughing, refining, and finishing. Join us Wednesday, July 18th at 7pm at the Paramount, St. Cloud.